However, Champagne is Champagne. My wife dropped her Diet Coke habit for Champagne. No other region manages to make a product as expensive, iconic, and controversial as Champagne. So, goodbye Amiens. Hello Reims! It may be the dead of winter, but finally, through obscuring trees, we sight our first grape vines. We settle into the cozy home with two fantastic lesbian hosts and their black cat. They set to work advising us on which sights and Champagne houses to visit. They also snap at us to pronounce Reims as “Raunce”, so we only make moderate fools of ourselves. We ramble between quiet brick and plaster buildings, worn by world wars. Art Nouveau survivors sprinkle the streets, including this masterwork from 1898: the cellar gate to Champagne house Mumm (later owned by Veuve and today by Jacquart). Reims, evidently, has always been a city of craft and business. At the Forum’s corner, we spy a sign glowing red. But down a narrow, dingy hall, we find the most fabulous wine shop. Here, Billecart-Salmon Rosé is a mere 49.90 EU. Here, rare and strange, small and huge producers pile every corner. €6.00. Yes, €6.00 gets us a bottle of François Arnaud’s 2009 Grenache blend from Cairanne, France: a rich but balanced ruby red, with medium intense aromas and flavors of young prune, dried black cherry, tomato, headed by a stony, pencil lead-like minerality and mint: Very good (4 of 5). From Touraine in the Loire we grab Yves Markevicinte, Vignoble de l’Ebeaupin 2011. It looks a clear ruby purple. It smells of black cherry, black pepper, chalk, and vanilla husk. Dry, twangy acidity, oodles of chalky tannin, mild 12% abv, and a medium body swap to flavors tart cherry, chalk, and orange peel of medium length. Very good (4 of 5). 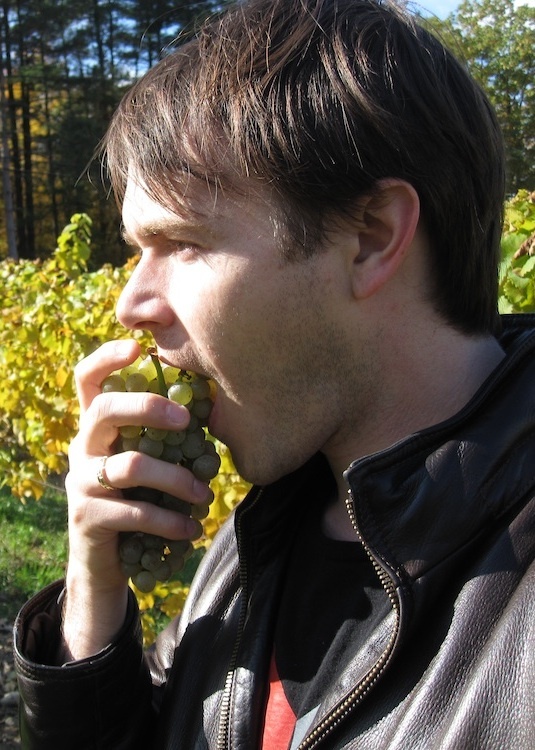 Daniel Savart is an adorably new, small grower, who grows only 2 hectare of vines around Écuel. Their L’Accomplie is a first pressing, mostly from the present vintage (blended with two years prior) and aged 50% on lees in vats and 50% in barrels with partial malolactic fermentation. It looks clear, lemony with fast, small fizz. Aromas smell youthful and zingy with tart strawberry, wildflower (chamomile), and fresh biscuits. It feels dry (7g/L), with extra acidity, an unexpected medium plus body (thanks Pinot Noir), and a lovely chalk dust yet fat and chewy fruit texture that clings to the teeth. Flavors of tart strawberry and violet candy lead to a long citric, chalk powder finish. Savart’s L’Accomplie is very, very good (4 of 5). Can drink now, has potential for aging. Bullet holes riddle this monumental arch. Today it faces entries to caves of Champagne houses. School children run about it doing a scavenger hunt. We even find Romulus and Remus at la Lupa’s teets, signifying this city’s connection to imperial Rome. It was cut from the same chalk caves as the Roman gate, which is also where Champagne ages. But the Champagne houses can wait for tomorrow (aka next Monday’s post). It is cold so we head back to base. Empty Art Nouveau buildings glitter as we pass. For this is the essence of Reims above ground. An ancient, artful, aspiring, mercantile city damaged by wars economic and military. This entry was posted in Uncategorized and tagged Chalk, Champagne, France, Reims, rome, Savart, travel. Bookmark the permalink. Definitely left wanting to see and read and taste more! I love the city of Reims (I always tell people to pronounce it like “France” without the “F”), although I have never seen it with snow on the ground! Great post, wonderful photos! France without the F! Per-ect! Thanks!